is also included on Destiny’s Child’s second album titled “The Writings On The Wall” (following their self-titled debut). 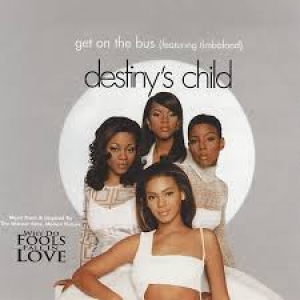 “Get On The Bus” is perhaps one of the most mediocre of the group’s earlier music videos as well as singles, both the song and its music video are easily forgettable. On The Bus” looks way too much like TLC’s music video for “No Scrubs” (although TLC’s music video looked way more advanced, thanks to the professional directing of mastermind Hype Williams) with a bunch of fancy-looking monitors, platinum and silver backgrounds, and with matching gray and white wardrobes to compliment all of it. this as “Get On The Bus” and “No Scrubs” came out roughly around the same season/month of 1999. Timbaland is also a guest rapper on this track although he doesn’t do much to make this low-key mess stand out. It’s nice to see the good old Destiny’s Child and all but this song and video is simply not where their heart was at.